The Wabash Hall of Distinction inducted its 4th class this past Saturday at the Wabash Middle School Auditorium. 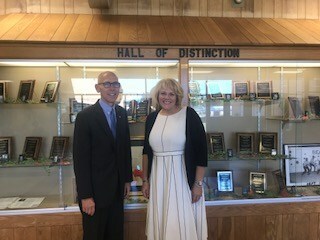 Hall of Distinction classes can be found on our district website. The 2017 Class included David Haist from the Wabash High School Class of 1969; Kim Grogg Marin from the Class of 1976; W.C. Mills from the Class of 1913; Julia Swain Thom from the Class of 1922; and Marie Daugherty Webster from the Class of 1878. The Wabash City Schools Hall of Distinction was established to preserve the history and tradition of Wabash City Schools. The Hall seeks to connect the successes of past graduates with the potential of our current and future students. Selection criteria and nomination forms can be found on the Wabash City Schools District site. Below are highlights of this year's inductees.